Catherine Holman Folk Art: He Graduated!! 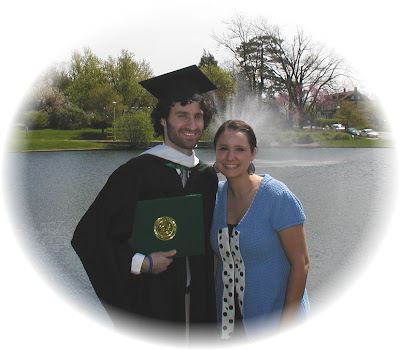 Eric graduated with his Master's Degree this past Saturday, May 2nd. It was a beautiful spring day and a beautiful ceremony as well. His sister, Amber, is quite proud of him too and loved returning to the campus where she graduated from. We are so proud of both of them and know the Lord blessed us the day these two entered our lives and formed a family. Yes congrats to Eric! You have two great looking kids! Yay for Eric and congratulations!! What a great accomplishment! Congratulations on your son's graduation! I know the wonderful feeling. My daughter graduated last year from Cal State Long Beach and I was flying! I am waiting for the day my son, who's name is also Eric, will graduate, too (although that's a ways away). What beautiful children you have, and I noticed your daughter looks just like you! Same beautiful smile! GREAT Job Eric!. What a lovely picture of your kids. Such a special day for the hole family. Congratulations all around! Well done!! Oh wow, how smart you both look. Congratulations! How wonderful! BIG congrats to him and to YOU! I have four sons and know how proud mother's can be..and should be! What a happy time! I know you are so proud of your children..and they should be proud as well. Congrats to Eric! Congratulations to Eric!! And Happy Mother's Day to you!! The graduation came at a perfect time! Yeah For him. Such a good job. i know you are very proud...Hugs...m.
congratulations to Eric :)))) is that you in the photo?? Congratulations to Eric! What a beautiful family, Cathie. That is wonderful, Cathie! Congratulations!!!!! You should be so very proud of him. Your children are absolutely beautiful, just like their momma. I can feel your pride in them and it is just contagious. Hi Catherine, many congratulations to your son...he really deserves the kudos.